If you’ve followed my last two posts, then you know my beloved MacBook Pro had to go in for repairs to the graphics card, which means they replaced my logic board (for free). Everything seemed to go well, but when I got it back, I noticed the trackpad wouldn’t scroll. I could grab the scroll bar and scroll the old-fashioned way, but when I moved my finger across the trackpad, the window wouldn’t scroll. It didn’t matter what program I was in either. Since he asked whether there were any issues, I checked in with Sean, the AppleCare technician who had been helping me set up the repair. I asked if there was a simple fix or if I should take it back in to be looked at. I was a little concerned that they might not have hooked everything up right, though that seemed unlikely. Instead, Sean asked if he could call me, and we went through several steps to rule out a hardware issue and try to find the problem. All my trackpad settings were good. We tried replacing the com.apple.systempreferences.plist file (hold down the Option key and select Library from the Go menu to get here—in Library, go to the Preferences folder). I had already removed the trackpad plist files in case they were corrupt. But none of this solved the problem, so we logged me into my admin user account and checked scrolling there. No problems, so that ruled out a hardware issue — something was messed up with my main user account, but we couldn’t find where it was. I will say, that I was impressed that Apple would spend this much time working with me when the repair had been done by a local authorized service location. Unfortunately Sean admitted defeat, saying he needed to research it and would call me back the next afternoon when he was back at work. Naturally, I didn’t want to wait that long, so I kept researching and looking into it. I knew the tech guy who replaced my logic board had zapped the NV-Ram on my MacBook when he was testing it, so I figured some setting got set back to default, but I couldn’t find it. I thought maybe a keyboard shortcut could toggle the setting, so I searched for that and found a really great site by Dan Rodney that lists them all (or most). This jogged my memory that there are settings in the Accessibility control panel in addition to the ones in the Trackpad control panel or General control panel, where we had already looked. Lo and behold, there was the problem setting. 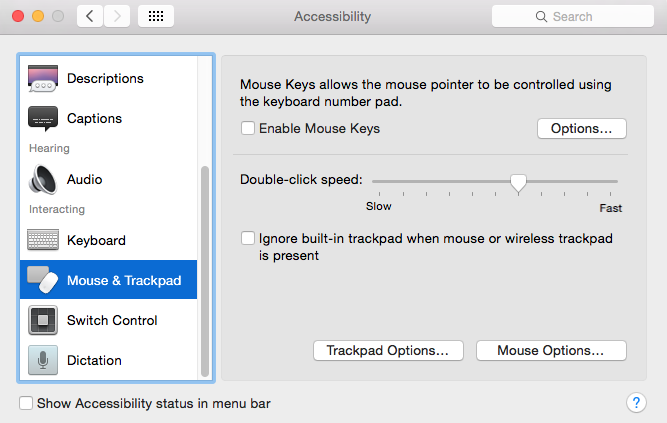 Under “Mouse and Trackpad” there was a button for “Trackpad Options” where “Scrolling” wasn’t selected. I clicked on that and the trackpad returned to normal!